Authors appearing on this page include Bala Bhadra, Kevin Barrett, K. Baskaran, M. Ramakrishna Bhat, Sage Bhrigu, Narayana Bhatt, Andrew Bloomfield, Ebenezer Burgess. Dictionary - Hindu words to English. Comment: Kevin Barrett is an Australian who has studied Vedic astrology since 1976. This book is intended for western astrologers. All the charts in the book are in the western round format, though the planetary positions in them are Lahiri ayanamsa. As a Vedic book, it's elementary. As a western book, it's pretty solid. The Dictionary in the back runs 44 pages, with several hundred brief entries, a very nice reference by itself. Barrett had previously self-published this book, which made it both expensive & hard to get. I was happy to see the Sagar edition. 1. Introduction; 2. Karam yoga & cuspal beginnings; 3. What is a cusp; 4. Cuspal interlinks; 5. Classification of karakas; 6. Inner thread; 7. 1st bhava; 8. 2nd bhava; 9. 3rd bhava; 10. 4th bhava; 11. 5th bhava; 12. 6th bhava; 13. 7th bhava; 14. 8th bhava; 15. 9th bhava; 16. 10th bhava; 17. 11th bhava; 18. 12th bhava; 19. How to use cuspal interlinks; 20. Epilogue. Comment: This is a book of Krishnamurti astrology, one of the rare ones to escape the Krishnamurti publishers. 4. What is karma and Can we change it? This is a book of Vedic remedies, updated and modernized by American Jyotish astrologer Anne Beversdorf. The Introduction gives a short synopsis of how to best use the book. Chapter one is the author's own story of her experience with pujas, which is both brief and not at all cloying, and, of course, positive. She used remedies to cure herself of depression, a most difficult disease to defeat. Chapter two continues with more successful examples, from clients and friends. Several of them were instinctively, and unknowingly, doing exactly the right things to ward off danger. And so on for the other planets, including Uranus, Neptune and Pluto, and the nodes. You total up each section and look at the results. If you're a reasonably well-balanced person (in which case, why are you here?) you may need to look closely to find your initial point of reference. For the rest of us, I'm afraid it's much simpler. You skip through the assessments until you find the one where it hurts. And that's you. In my case - no surprise - it was Saturn. There follows a brief, fascinating section, where you take the problem planet and apply it to the house it rules. I caution western readers they must set their chart in the Sidereal zodiac (Lahiri ayanamsha, or Fagan-Bradley) and then consider those cusps, not their typical western ones. The problem planet produces problems in the house(s) it rules. You then turn to Part 3, the solution section, and set about performing the various tasks you will find there. With Saturn, I am, first of all, to follow all rules strictly. Which is a lesson I have learned many times. My day of action is Saturday (Saturn's day) and on that day I am to give black coffee to a homeless person, mow a cemetery, take trash to a recycling center, volunteer in a homeless shelter, feed sunflower seeds to crows, etc. I could even pass the time on Saturdays listening to Mozart's and Faure's Requiems. (The Berlioz requiem, too, I think.) Which I can do easily. Which is almost cheating. Wouldn't Saturn want more work than that? It's notable that in a very large collection of music, I have no requiems at all. Which I think is an instinct to avoid the problem, which I suspect is common. Beversdorf concludes her book by giving us "the rest of the stories" from the second chapter, the friends who were comforted by specific remedies. She tells us what those remedies were. For one man, the solution to unemployment and headaches was throwing cinnamon red hots into a stream on Tuesdays! Anne has written on a very old, very hoary topic. To have updated it to include cinnamon red hots is a notable accomplishment. The appendices are useful. Appendix A, prayers, includes both Sanskrit (which you were expecting) as well as choice Christian and Old Testament extracts. Appendix B give two good sources for pujas. Appendix C is a handy alphabetical list of ailments and their corresponding solutions. Appendix D are the twelve remedies, in brief. For Saturn, Sing the Blues on Saturday! The Bibliography is an excellent selection of relevant books, and the reasons to study them. It is followed by a 13 page index. This is the best book of remedies I have yet seen. I don't give gold stars to Vedic books because I do not clearly understand the system, but this book deserves one. I only caution that it is written for a western audience. Native Indians may not be able to follow it. Which is a triffling detail. The author has written and published in America, where all the Americans are, and where the need is truely great. Comment: An introductory book intended for lay persons. There is a lot of general theory & structure about planets, signs & houses. Wisdom Tree (of India), 318 pages. 4. Principles of time rectification in a horoscope. 43. (Swar Shastra) This chapter is entirely in Hindi. There is no English. The author is a 1990's graduate of the Bhartiya Vidya Bhavan of New Delhi. While the school as a whole dates to 1938 and covers many subjects, since 1987 its astrology courses have been under the administration of K.N. Rao. Which makes Vishnu Bhaskar a graduate of K.N. Rao's school, a high distinction. Bhaskar is the founder and director of the International Institute of Vedic Astrology (IIVA). I mention this as the production of two massive volumes implies both great talent as well as great organizational skills. 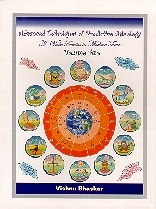 This is a comprehensive, detailed sketch of Vedic astrology. There is virtually nothing omitted, indeed, there are many details that I have never seen before. Not merely natal and forecasting, but also medical (very rare), along with astro-meteorology (even more rare), Prashna, Jaimini, Stri Jataka (female horoscopes), relationship matching, mundane and more, including systems based on sticks in the ground and turtle shells, which, if I am not mistaken, have only just been recovered from oral tradition. In the annexures (appendices), even more, including a sketch of the Krishnamurti system. Note that, with one exception (Chapter 43), the text is entirely in English, but various scattered tables are only in Hindi. It might be these two volumes were not intended for the export market, as few non-native speakers are fluent in Hindi. At least, I presume it's Hindi. These two volumes will be expensive to ship overseas. Current international postage rates are in excess of $50. Apologies. These books would make a fabulous addition to almost any Vedic astrologer's library. Alpha Publications, hardcovers. Volume 1: 353 pages. Volume 2: 357 pages. Comment: This book was inspired by a close study of Prasna Marga (available in an English translation by B.V. Raman), there are many references to it. Like Prof. P.S. Sastri, M. Ramakrishna Bhat brings great wisdom & scholarship to his work. 21. Transits; 22. Ashtakavarga. Appendix: What is Pancanga? ; Index. A detailed & demanding book. Contents: Part 1: Significations of the planets & houses: 1. Zodiac & the 12 signs, astrological nature, influence, characteristics, functions of Sun, Moon, Mars, Mercury, Jupiter, Venus, Saturn, Rahu & Ketu. Their signs of exaltation & debilitation; their own signs; their friends, enemies & neutrals. 2. The significations of the 12 houses of the horoscope. The 12 houses termed as: Tanu, Dhana, Sahaja, Sukha, Suta, Ripu, Jaya, Ayu, Dharma, Karma, Labha & Vyaya, according to their significance. Part 2: Bhrigu Sutram: 1. Effects of Sun in the 12 houses. Dispositions when Sun in spite of being a malefic gives very beneficial results & gives rise to Raja yoga. Difference of effects when Sun is in own sign, sign of exaltation, enemy sign, etc. 2. Effects of Moon in the 12 houses. Difference in effects of Moon when posited in a house in different signs; difference of effects of a waning & waxing Moon; dispositions when Moon produces Rajayoga, difference in effects when Moon is in own sign, sign of exaltation, sign of debilitation, etc. 3. Effects of Mars in the 12 houses. How a great malefic like Mars becomes a yogakaraka. Difference in effects of Mars in different houses when in own sign, sign of exaltation, sign of debilitation, etc. Dispositions when Mars produces Ruchaka yoga, Dhana yoga & Raja yoga & their results. Special yogas for sexual perversions. 4. Effects of Mercury in the 12 houses. When a benefic Mercury can become a malefic. Difference in effects of Mercury in different houses when in own sign, sign of exaltation, debilitation, etc. Dispositions when Mercury produces Bhadra yoga, Amla yoga, Dhana yoga & Raja yoga & their results. 5. Effects of Jupiter in the 12 houses. Difference in effects of Jupiter in own sign, sign of exaltation, sign of debilitation, etc. Dispositions when Jupiter produces Hamsa yoga, Amla yoga, Dhana yoga, Raja yoga & their results. When lords of 6th, 8th & 12th houses become yoga karaka planets. Jupiter good even when is lord of 3rd & 12th houses. 6. Effects of Venus in the 12 houses. Difference in effects of Venus in own sign, sign of exaltation, sign of debilitation, etc. Dispositions when Venus produces Malavya yoga, Amla yoga, Dhana yoga & Raja yoga & their results. Venus gives yoga effects when posited in the 6th & 12th houses. 7. Effects of Saturn in the 12 houses. When a great malefic like Saturn gives very beneficial results & functions as yoga karaka planet. Saturn gives long life when posited in the 8th house. Effects of Saturn in own sign, sign of exaltation, sign of debilitation, etc. Dispositions when Saturn produces Sasa yoga, Dhana yoga & Raja yoga & their results. 8. Effects of Rahu & Ketu in the 12 houses. Controversy about the roles of Rahu & Ketu in a horoscope & different views in that regard. Comment: This book includes the original Sanskrit slokas, translated & with commentary. Further commentary is provided by Brihat Jatak, Phaladeepika, Saravali, Chamatkar Chintamani. For its limited scope, this is a very nice book. 1. Introduction; 2. Manglacharan; 3. Sun; 4. Moon; 5. Mars; 6. Mercury; 7. Jupiter; 8. Venus; 9. Saturn; 10. Rahu; 11. Ketu. The result is a bit choppy. The planets through the houses, with notes on signs & aspects. The introduction is some 46 pages in itself. Part 1 - The basics: Birth time adjustment, The chart, Step 1 - The nature of the rising sign, Step 2 - Planets in the first house, Step 3 - No planets in the first house, Planets & their meanings, Aspects, Planetary exaltation & debilitation, Retrograde planets, Planetary friends & enemies, Mahadasha - the major cycle of the planets, Another method of prediction - transits, Navamsha, Remedial measures, Astro-locality, Summary. Part 2: Reading Charts: 1st house: The body; 2nd house: Wealth; 3rd house: Creativity; 4th house: The mother; 5th house: Children; 6th house: enemies; 7th house: Marriage; 8th house: Transformation; 9th house: The father; 10th house: Career; 11th house: Opportunity; 12th house: Actualization. 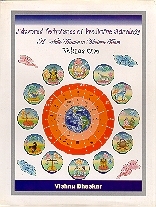 Appendix: Vedic astrology resources; Glossary; Index; About Parasara's Light vedic astrology software (CD included). Comment: For each house, there are example charts- 18 for the 7th house, 6 charts for the 9th (which is a more typical number), more than 100 in all. Like many beginner books, you should ideally find this in a store, skim through it & love it or not, as it speaks to you (or not). It is a nice book. The best thing about it is the free CD Rom of Parasara's Light software in the back. It's Windows-only (sorry Macs!). This will let you do basic on-screen chart calculations & pretty much everything described in the book. It is otherwise a tease for the full program, which is $299. Which is a lot for a limited-use specialty program of any kind, frankly. 1. Mean motions of the planets; 2. True places of the planets; Directions, place, time; 4. Eclipses, lunar eclipse; 5. Parallax in a solar eclipse; 6. Projection of eclipses; 7. Planetary conjunctions; 8. Asterisms; 9. Heliacal risings & settings; 10. Moon's rising & setting & elevation of her horns; 11. Certain malignant aspects of the Sun & Moon; 12. Cosmogony, geography, dimension of creation; 13. Armillary sphere & other instruments; 14. Different modes of reckoning time. Appendix: Footnotes & corrections to the text, calculations of eclipses, stellar map (folds out nicely); Sanskrit Index (in Roman characters); English index. Comment: Born in 1805, Ebenezer Burgess was an American missionary who spent 15 years in India (1839-1854). During his time there he found a need for a good text on Hindu astronomy, and so made this translation, first published in 1860. Mr. Burgess died in 1870. This is a reprint of the 1935 reprint by Calcutta University. Burgess concludes the Hindu civilization dates back to 2000 BC, and no earlier. Their knowledge of astronomy was therefore not derived from the Greeks. Among many other analysises, he carefully compares nakshatras to Arabic & Chinese lunar mansions. I can find no astrology in this book, but it will be a useful resource for the serious student. There are no Sanskrit slokas in this book.